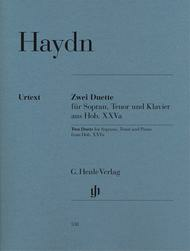 2 Duets for Soprano, Tenor and Piano Hob.XXVa:2 and 1 composed by Franz Joseph Haydn (1732-1809). Edited by Marianne Helms. For Piano, Tenor, Soprano. Voice. Henle Music Folios. Pages: V and 19. Softcover. 24 pages. G. Henle #HN538. Published by G. Henle (HL.51480538).